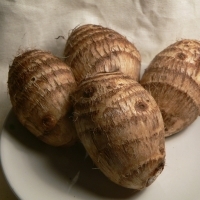 Taro is a staple crops of the Pacific Islands and is also very popular throughout many parts of Asia. The delicious tuber can substitute potato in almost any dish, baked, boiled or made into chips. Its very ornamental heart-shaped leaves make a great spinach when cooked thoroughly. Note that Taro leaves contain a oxalic acid, which will cause irritation to the throat if the leaves are consumed without sufficient cooking. T he plant prefers moist, deep soil and it grows well in both full shade and full sun. 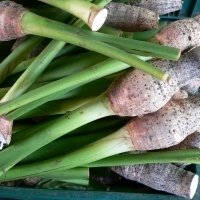 Be aware that the Taro looks quite similar to the Elephants Ear which is a common ornamental plant but is NOT edible.